In the famous Chettinad Healthy cooking tradition of Southern India, these foods evoke South Indian forgotten by Chicken Tikka Masala enthusiasts. Mostly vegetarian, these recipes allow home cooks to create such esoteric: dishes as Potato-flled Dosas with Coconut Chutney; Pearl Onion and Tomato Sambhar; Chickpea and Bell Pepper per Poriyal; and Eggplant Masala Curry. Rasams, breads, legumes and payasams are all featured here, as is the exceptional Chettinad Chicken Kolambu, South lndia's version of the popular vindaloo. Each of these low-fat, low-caloric recipes come with a complete nutritional analysis. The authors of the top-selling Art of South Indian Cooking are back with a new book—featuring both new and revised recipes with a healthy approach to traditional Indian cooking! 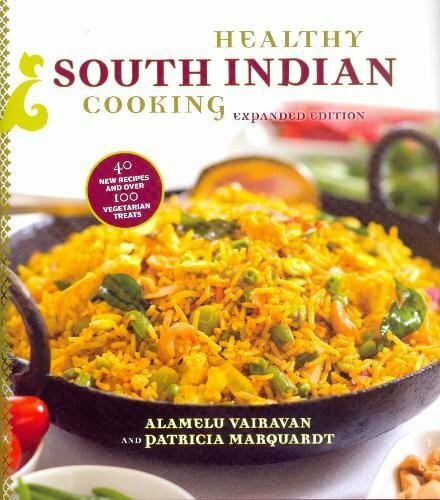 In this book, co-author Alamelu and I have presented a comprehensive collection of nearly 200, mostly vegetarian, recipes originating in the rich cooking tradition of South India with its emphasis on wholesome vegetables and legumes flavored with aromatic spices. The easy-to-follow recipes will guide the reader in preparing a wide array of authentic dishes such as Masala Dosai with Coconut Chutney, Pearl Onion and Tomato Sambhar, Green Beans Poriyal, and Eggplant Kootu. Each of these traditional recipes includes complete nutritional analysis. Also included in the book are sample menus of complementary dishes and suggestions for integrating South Indian dishes into Western meals. 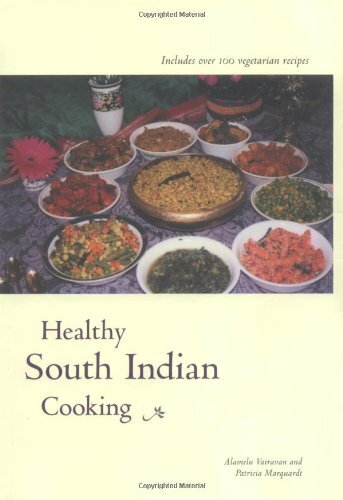 A section on the varieties and methods of preparing dals, a multilingual glossary of spices and ingredients, and 16 pages of color photographs make this book a useful introduction to the healthy, delicious cooking of South India. 2. Healthy South Indian Cooking. Vairavan, Alamelu; Marquardt, Dr Patricia.